It is a truth universally acknowledged that if you want to be my friend you have to like Jane Austen. Tell me that you don't like one of her novels and I will judge you. Ask me, as someone recently did, who Jane Austen is and I will pass out from shock, recover and judge you, and then I will pass out again. As with many book mad people, the books I love have become part of my identity. Tell me you don't like Jane Austen and you are telling me you don't like part of who I am because I can trace Jane Austen and her novels back through my life from the first reading to the five millionth. The characters are almost like people I know, friends I wish I had. When you say Fanny Price is boring I wince in sympathy as if she can hear you and be hurt. Because she isn't boring, she is just misunderstood. Emma has her flaws, of course she does, but we love her in spite of them. We, like Mr. Knightley, see her potential. When you say you don't like Jane Austen, or Angela Thirkell or Georgette Heyer or any of my other beloved authors, I can't help but wonder what we can possibly have in common. I may be slightly exaggerating here but there is an element of truth. When we meet people we automatically look for common ground. Do we come from the same part of the country? Do we both have kids? Do we work in the same field? You like to bake? Oh, so do I. When we find that bit in common, that meeting point, we also find the potential for friendship. I ideally like to find that meeting point with books. Now, obviously, I can't reject as a friend everyone who doesn't read Jane Austen. I would be a very lonely person if I did. I can't even reject everyone who does not like to read, as horrifying as that is. But when I do find someone who likes to read or when I discover a new book blog the first thing I do is find out what books they like, which are their favorites. And if Jane Austen is one of them, well then, we have that bit more in common. They are my kind of person. And if they do not like Jane Austen or another of my favorite authors it makes me wonder about other ways in which our thoughts would not mesh. This sounds a bit as if I am not open to differences and as if I think everyone should think the same way I do. That isn't what I mean. I like a good book discussion as much as the next person. I am happy to debate whether that book I read yesterday is really worth reading. However, there are some books that are so much part of our identity, books we have read over and over and absorbed into our psyche to such an extent that they are part of us. Some of these are books from our childhood, It is impossible to imagine not loving Little Women or the Little House books. Some are more recent finds. I think Mollie Panter-Downes novel, One Fine Day, is an exceptional book. But whether they are long loved and often read favorites or something we fell in love with last week, they do something to us. They become part of who we are. Because all dedicated readers are made up of the books they have read and loved. It is through those books that we have learned about different countries and different cultures and different times in history. We have learned about love and loss and how to deal with both. We read about the mistakes characters made in books and hopefully we don't repeat them. Books have educated us and comforted us and helped us to become who we are today. We are defensive of those books and those authors because we identify with them. They are us and we are them. So tell me, do you like Jane Austen? 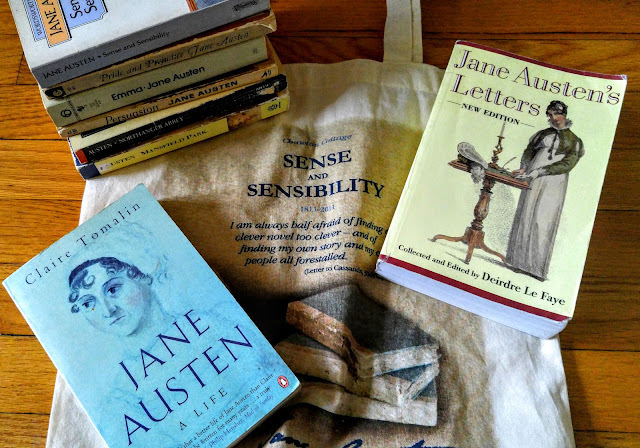 I love Jane Austen, and I have the same edition of her letters. I admit I haven't read all of them, but I was looking at it yesterday thinking about where to fit it on my ever-shifting list of books to read. I found her letters fascinating. She was so witty and insightful. Sometimes biographies of her life can make her seem so inaccessible but reading her letters made her so real and everyday. If you can call a famous author everyday. I do like Jane Austen and like many other single, middle-aged women I also like cats. When I moved into my last neighbourhood the first person to call on me was a lilac-point siamese: handsome, cheerful, and good-natured. I didn't know his name so I called him Mr Bingley and when I met his humans they immediately understood who and why so they became friends too. It wasn't the same with the lady at the top of the street who had a striking ginger tom, a sea-farin', adventuring cat if ever there was one. Naturally I called him Captain Wentworth and several years later I found out that she called him Fred. Fred! I nearly died of happiness right there on the pavement outside her house and she kept saying things like, “No, his name is Fred... just Fred. Who is Captain Wentworth, anyway?” and looking to Mr Bingley's human for support while I burbled away about amazing coincidences. I'm sure she's a very good sort of woman but I have to avoid her now and other people don't understand why. Beth March died when I was eight and that's how I learned that you don't have to be old to die. It was quite a shock and I can remember vividly how upset I was. Later I wrote a story in which she didn't die but it was so melodramatic it made 'East Lynne' sound like one of Mr Fordyce's sermons. It was the Avonlea books that prepared me for life though... really. I got through so many awful situations in my teens and early twenties by doing what I thought Anne would do. I'm 52 now and I still wish I had studied at Redmond, visited Priscilla in Japan, travelled the world with Katherine, and eventually returned home to White Sands to marry the Episcopalian minister. I love this comment! And now I want another cat so I can name it Captain Wentworth. Beth's death was very traumatic. My daughter found out that Beth dies and now she won't read the book. I keep trying to convince her to anyway because Little Women was a huge part of my childhood. We will see who wins. And Anne, of course Anne. I wanted to be Anne and continually wished I had red hair. I still kind of do. She just felt so real to me with her imagination and her quick temper. Thank you for commenting. It brightened my whole day. I am still chuckling over "I'm sure she's a very good sort of woman but I have to avoid her now and other people do't understand why." Yes, I do like Jane Austen - and while I can appreciate that other people don't, I would be shocked too if someone asked me who she was! I also love Georgette Heyer (I'm in the middle of Regency Buck at the moment) but I have to admit I haven't tried Angela Thirkell yet. I'm sure I'll like her when I do get around to it. Oh yes, try Angela Thirkell. Some are better than others but all are enjoyable. Yes, I can be friends with people who don't like Jane Austen (and other favorite authors), but it's a stretch. I feel so much more comfortable with those whose tastes are similar. As you say, my beloved books have been so important in shaping my whole approach to the world - they really are a part of me. It is interesting to see how our books have an ongoing impact on our live. So, favorite authors. Who are yours? I am always looking for new ones. I do like Jane Austen although I haven't read her in a few years. And I really enjoy Angela Thirkell. Oh good, another Angela Thirkell reader. Hmmm, Canadian Literature. I grew up reading the Anne of Green Gables books. Does that count? Tell me where to begin. I have a feeling I am missing out. I loved this! Wholeheartedly agree, my favourite books feel like essential parts of me. Thank you. I am glad you liked it. We wouldn't be the same people without our books, would we? I like Jane Austen! She's sharp and funny and so fiercely intelligent she sometimes scares me. And I get what you're saying. While getting to know someone recently, when I learned that she reads very little and watches almost no movies or TV shows except for reality TV, I judged. I also quailed, because how on earth was I going to relate to her? Books and movies are my conversation crutches! If I can't find a common interest in one of those to talk about, I'm not going to have a lot to say. I like a reeeeeeally wide variety of movies and books, so I can usually find at least some kind of common interest with a new acquaintance, and we'll have something to discuss. But the only reality show I've ever liked much was Trading Spaces, and... home improvement shows are NOT the kind of reality TV she was talking about. Sigh. Yes, exactly! Books are my conversational crutches. What a good description. I end up feeling lost if someone doesn't read at all. I can talk about other things (obviously) but books are my safe space. I am not big on reality TV either though I did watch Trading Spaces occasionally. So now I wonder, what does everyone else use as conversational crutches? Their kids? Their jobs? Sports? I know a lot of fellow moms who talk about almost nothing but their kids, and it kind of drives me nuts, because I'm like, "Um, but who are you as a person? Enough about your kids -- what do YOU like to do, read, watch, think about?" And then they back away slowly from the crazy woman, especially when they find out I homeschool and STILL insist on thinking about something other than my kids once in a while. Hmmm. There is this strange belief among some people that in order to be a good mom you must totally subsume your own identity into that of your kids. I don't get it. I love my kids but I really want to be seen as a separate person with separate interests. My kids are going to grow up and leave. If they are my identity, what happens then? This is a subject I can rant about which makes people think I am a crazy woman too. I think it's something I'm particularly mindful of because when both my brother and I had gone off to college and my mom had no one left to teach and mother, she ended up on antidepressants. And it's not that she didn't have hobbies and interests apart from us, because she's a big reader and crocheter. I have a much different personality than my mom, but at the same time, I am now very aware this could be an issue if I make my kids the main focus of my life. I'm so glad I have my writing too!